Sasco, Arizona is a ghost town in southern Arizona located about 35 miles northwest of Tucson. The once bustling smelting town fell dormant after only a few years of being active, leaving several ruins behind. Today, the ghost town provides visitors with a chance to walk around the old foundations. Sasco – once one of the “premiere smelting towns of the southwest” – remains today as one of Arizona’s lesser-known ghost towns. The name Sasco is actually an acronym, short for Southern Arizona Smelting Company. The town was built in 1907 by said company. Unlike most other ghost towns around the state, Sasco wasn’t a mining town – meaning ore wasn’t dug out of the ground on site. 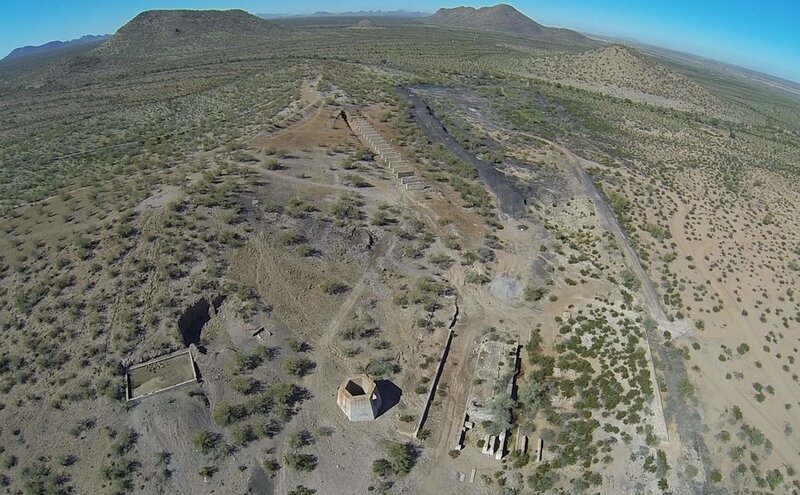 Rather, Sasco was a smelting & milling town – which processed ores from nearby mines such as the Silverbell Mine to the southwest and mines near Picacho Peak to the north. The site of Sasco was chosen because of its geographical advantages, being about halfway between the two major groups of mines. Sasco also isn’t far from the Santa Cruz River, which flows just east of the site. The actual development of Sasco is unique in itself. Frank Murphy, head of the Development Company of America (DCA) and the man behind the creation of the infamous Bradshaw Mountain Railroad (the current road to Crown King is built on much of this) was a businessman and visionary. He developed a concept of creating a large scale mining operation concentrated in one area rather than several small operations. In 1904, Murphy constructed the Arizona Southern Railroad which connected the Silverbell Mine to the Southern Pacific Railroad in Red Rock to the east. The daily train transported people and supplies as well as precious commodities like water and copper in and out. Murphy then began on the construction of Sasco, the smelting site about halfway along the rail line to Red Rock. Work began in the summer of 1907 and finished in February of 1908. The town of Sasco was impressive. A post office was established in 1907. The town housed a residential neighborhood, a large smelter, numerous stores and saloons, a jail, hotel, and a power house to supply electricity. At its peak, Sasco was home to about 600 people. Financial trouble for Murphy and the DCA in 1911 spelt disaster for Sasco. Murphy filed for bankruptcy and the smelter at Sasco was shut down. Up to this point, it had processed over 240,000 tons of ore. In 1915, ASARCO bought the operation at Silverbell and with it, reopened Sasco. Sasco’s second wind was short lived. Winter of 1918 and 1919 brought with it a pandemic – the Spanish Flu (influenza). The outbreak reached Sasco and killed many residents, many of whom were buried in unmarked graves at the Sasco Cemetery. The town was devolving fast. In April of 1919 the murder of Charley Coleman only added to the towns dwindling reputation. Coleman’s wife lived in Sasco and apparently was being hit on by other men. Charley, who lived in Tombstone at the time, got wind of this and decided to head to Sasco to settle the score and kill the two men hitting on his wife. Upon arrival to Sasco, Charley got into an argument with his wife. The owner of the saloon who had already heard about Charley’s intention of killing two men heard the argument in process and fetched is 30-30 rifle. He returned to Charley and shot and killed him on site. The post office was discontinued in 1919 and by 1921, ASARCO had closed down Sasco again. In the 1930s, copper prices crashed and many of the buildings (including the railroad) were destroyed. Today, numerous foundations and ruins still remain. The large smelter stack remains and is the focal point of the ghost town. Stamp mill foundations just east of the smelter remain in addition to several elevated railroad platforms to the north. The Hotel Rockland stands further east close to the main road (Sasco Road). It is made of distinct, volcanic stones and is hard to miss. Unfortunately, the ruins at Sasco have been vandalized and abused over the years. The ghost town has been used as a paintballing arena in recent years and a large amount of trash and graffiti remains today. It is still very much worth a visit. The fact that it is a smelting town sets it apart from most other Arizona ghost towns. To reach Sasco, travel 7 miles east from Red Rock Exit on I-10 (#226) and head west. Stay on Sasco Road as it weaves through a residential area. The road passes through farm land and then crosses the Santa Cruz River which may or may not have water flowing across the road. If the water is too high, an alternate access point is through Marana (exit #236) further south. Head west on Marana Road which will connect to Silverbell Road. Silverbell Road eventually loops up to Sasco Road. All roads are dirt. High clearance recommended. Numerous 4WD trails dot the area as well. "Sasco, Arizona" Wikipedia. Wikimedia Foundation, n.d. Web. 16 Jan. 2016. <https://en.wikipedia.org/wiki/Sasco,_Arizona>. Schulhauser, Randal. "Sasco to Silverbell Ghost Towns • Hiking • Arizona • HikeArizona.COM." HikeArizona.COM. N.p., n.d. Web. 16 Jan. 2016. <http://hikearizona.com/decoder.php?ZTN=984>. Sherman, James E., and Barbara H. Sherman. Ghost Towns of Arizona. Norman: U of Oklahoma, 1969. 134. Print. Varney, Philip. Arizona Ghost Towns and Mining Camps. Phoenix, AZ: Arizona Dept. of Transportation, State of Arizona, 1994. 95-97. Print.